Through an abstract collage of familiar imagery (Turtles, ninja weapons, Splinter, the sewers), one of the Turtles contemplates their relationships through stream of consciousness babble. He thinks about how they have been hiding and searching for themselves for 16 years. He thinks about how Splinter is not just their master, but “the one”. He thinks about how he and his brothers are “four” and “forever”. Yet also, sometimes they are not his brothers, but reflections of his own inadequacies and loneliness. He considers how all these numbers and variables are too confusing to keep track of. Don is suddenly roused from his drawing board by one of his brothers (either Raph or Mikey). They’ve come back from McDonald’s and it’s about time for “Cops in Budapest”. Don snaps out of it and tells his brother that he’s been studying art lately and it kind of got him itching to experiment with what he’s learned. The Turtle takes one look at Don’s surrealist sketchbook and immediately thinks Don is on something. Don laughs and agrees that his attempts at art maybe aren’t so hot. As they leave to go watch TV, Splinter takes a look at the sketchbook for himself. He is immediately fascinated by Don’s profound musings. *The credits don’t specify which creator contributed to which portions of the comic, though I imagine it was a highly collaborative effort. The last page is very clearly Dan Berger’s pencils, however. So this is the story that ends Turtle Soup, though I don’t think it was supposed to be the last installment (Turtle Soup was meant to be an ongoing, not a limited series). As a parting shot, “Thoughts on Paper” offers some very strange visuals and a genuine change of pace for the anthology. Most stories in Turtle Soup have been action/adventure pieces or dumb absurdist comedies. There were a handful of introspective shorts that were definitely highlights, but even those were pretty typical in terms of their art direction (though they were certainly attractive-looking, don’t get me wrong). 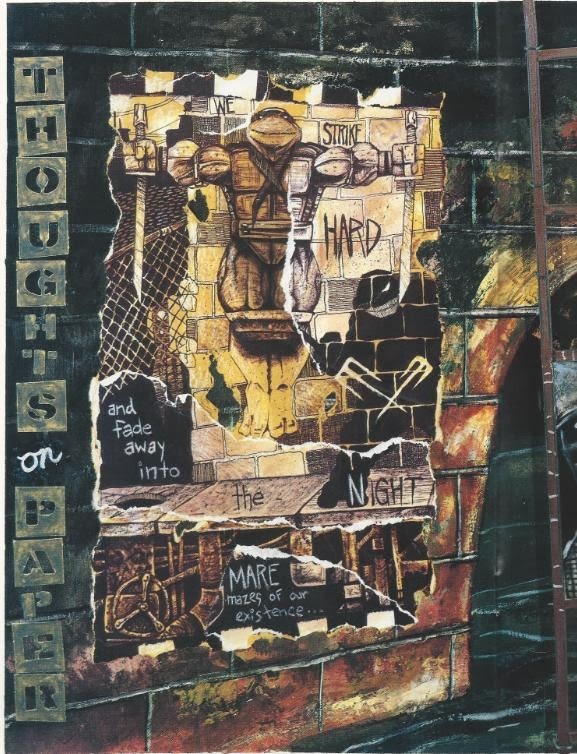 “Thoughts on Paper”, on a surface level, looks to be Gaydos and Berger trying their hands at aping the style of Dave McKean; that abstract collage and cut-out style that’s uniquely his. 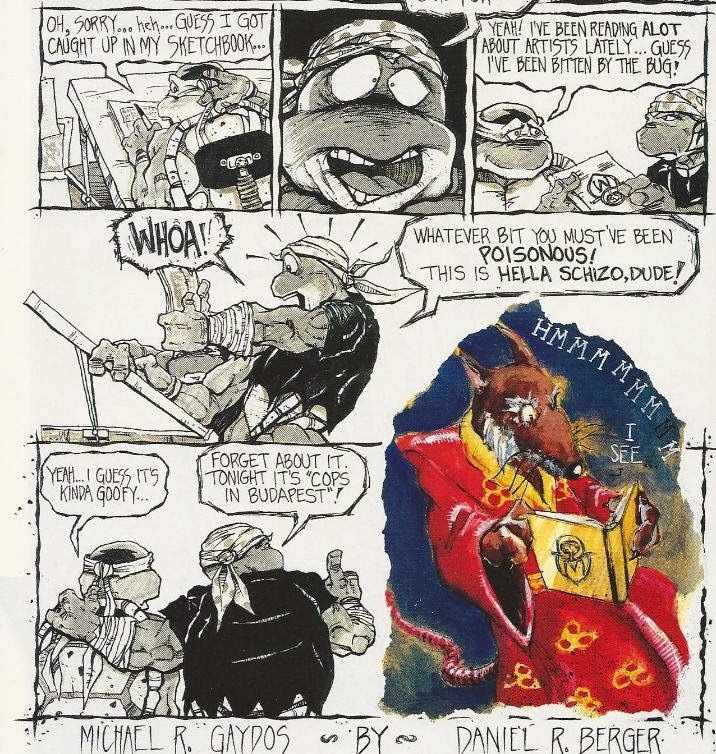 The context of the story revealed in the final page explains that Donatello is attempting to mimic the art styles of others to learn more about the craft, which was a nice meta reference and also helps take the edge off of any excess criticisms regarding Gaydos and Berger’s success at copying McKean. While it definitely does feel like pastiche stuff, I think they did a pretty good job of applying that weird graphic flavor to the Turtles. The text is a bit hokey, but again, the context puts it all into perspective. I do kind of wish that the Turtle drawing the comic had been revealed to be Michelangelo, not Donatello. Art and storytelling was something Mikey was established as taking an interest in way back in TMNT (Vol. 1) #17 and future stories published after this one would continue showing him working on his craft. While there’s certainly nothing wrong with Donatello taking a crack at art, I think it would have been a nicer moment for Mikey’s character development, personally. On the other hand, it’s kind of a nice companion piece to “Credo”, a short that deals with Donatello struggling to put his feelings into words. In this case, Don is trying his hand at putting his feelings into art and having just as much trouble. In both stories, Don gives his age as 16, so they actually go back-to-back fairly well (the setting in the final pages even implies the ramshackle farmhouse). All in all, “Thoughts on Paper” is one of the most unique installments in the Turtle Soup anthology, though easy to overlook because it’s more of a visual experiment than a full-fledged story.